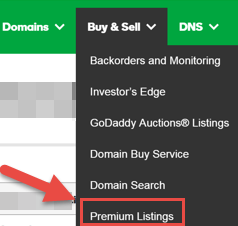 If you add multiple domain names to Premium Listings, you can use various criteria to quickly search for them in the Domain Manager. Starts With — Search for domain names beginning with the entered value. Contains — Search for domain names that contain the entered value. Domain extension — Search for domain names with the entered extension, for example, .com or .net. Status — Search for domain names with the selected Premium Listing status. Auto Renew status — Search for domain names with the selected automatic renewal status. List Price — Search for domain names with the entered list price. Click Search. Your search results display.